You’re waiting for the next race to start when you feel a tap on your shoulder. You turn around and the first thing you notice about the new driver is her hat. Her giant, pink, furry monster hat. It looks like a creature with floppy arms and three giant green eyes is trying to swallow her head. Underneath the hat, Mikka’s staring at you with a big, expectant grin. She laughs, “See you at the flags! Winner buys the candy!” And then she turns and skips towards the starting grid. And right when she turned away, you think — wait, did those green eyes on her hat just blink at you? You shake your head. Nah, impossible. 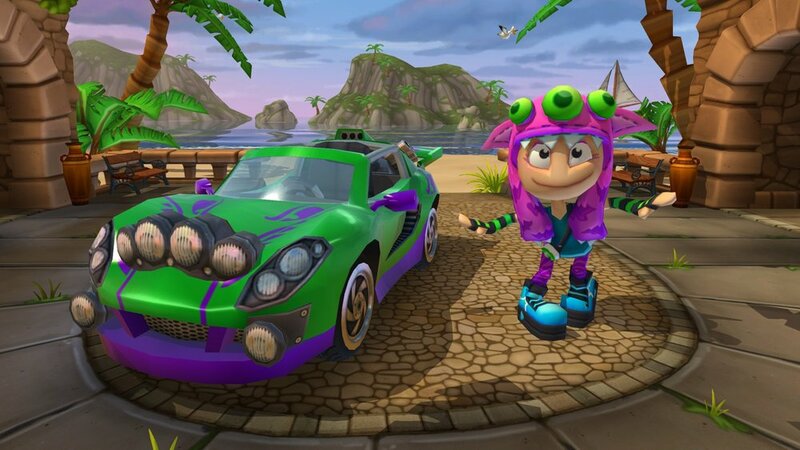 With her neon clothes, platform boots, and bouncy attitude, Beach Buggy Racing 2’s newest racer Mikka makes a strong first impression. Wacky and maybe a little unhinged, Mikka lives life in the moment…. in other words, she likes to take time and eat the flowers. 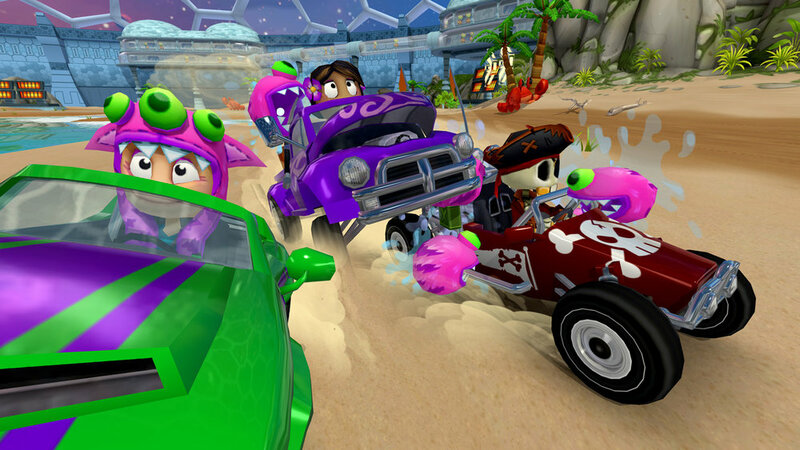 Although she sometimes seems like she’s not paying attention, Mikka is a formidable racer, and her special character ability is as powerful as it is unique. 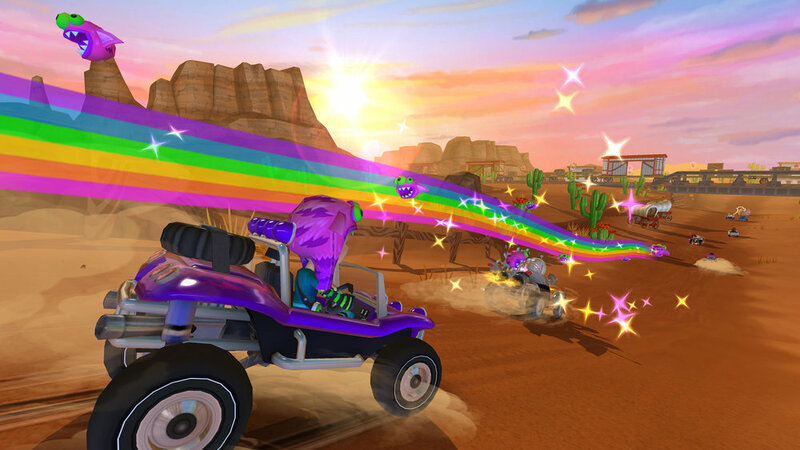 Once per race, she can summon a gigantic technicolor monster head which flies down the track, trailing rainbows and spewing tiny baby monsters that attach themselves to other cars and slow them down. Mikka may be a little unusual but she has won the other racers’ respect with her winning spirit and relentlessly positive attitude. She also loves making clothes, and the rumor is she’s the only person in the world Beach Bro trusts to mend his precious Aloha shirts when they need repair. And what about the monster hat? Is it alive? Is it magic? Only Mikka knows for sure. But if you ask her about it, she’ll probably steer the conversation towards candy. Stay tuned for the next blog update, where I’ll introduce you to the trip-tastic tunes of Beat Bot!